You might have an idea about what you want, or feel overwhelmed by the choice available. Whatever you feel right now, just take some time to decide. There is no hurry. Remember that once you buy this stone, you won’t be replacing it, and you will be visiting it for a long time, so it needs to be right. In the height of grief, it is difficult to make decisions with a clear head (I call it ‘having my grief head on’). So don’t make any big, expensive purchases in the early weeks after your loss, especially if it is a sudden loss, as you will find it difficult to focus. Again, give yourself time to consider your options. Any decent stonemason will go out of their way to produce exactly what you want, if they can’t then you might want to consider using another supplier. 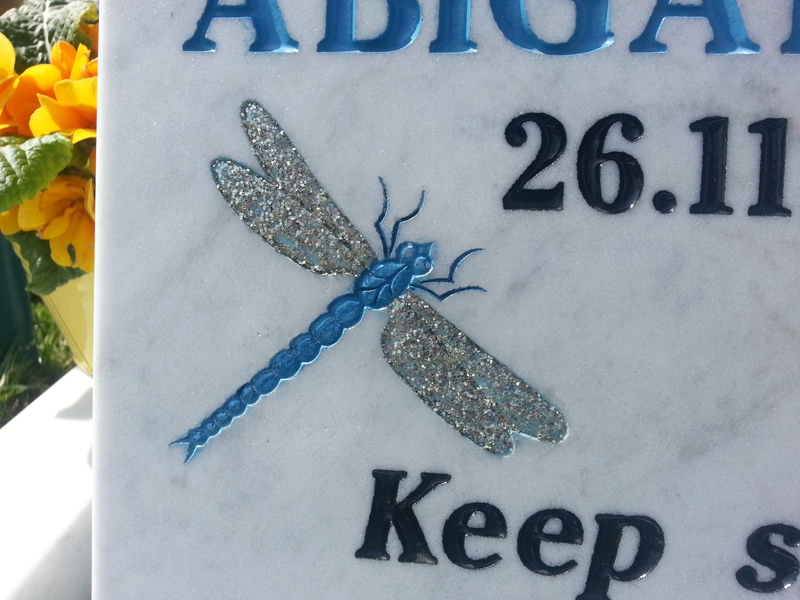 When we chose Abi’s stone, we wanted three dragonflies engraved on it. This was something they hadn’t done before but it was never a question of ‘no’, but rather ‘how’. With consultation and our approval throughout, the three dragonflies became one dragonfly. We wanted it blue (Abi’s favourite colour) and so the body was painted blue, and they even added sparkle to the wings to really bring it to life. These were all fairly experimental but the glitter has lasted its first full year of harsh rain and wind so it was a job very well done. At this stage, it’s important you have a good relationship with the company you have chosen. These tips come from our stonemason, Cleevely Memorials, a family-run business. During the weeks while they created the stone, we met several times to discuss the design and progress. We had a good rapport and completely trusted them to interpret our ideas accurately. Keep your design fairly simple. You can write whatever you want, though most people include the full name and date of death (and birth) at the least. Don’t feel you have to use the same lines as everyone else, choose something personal to the deceased. 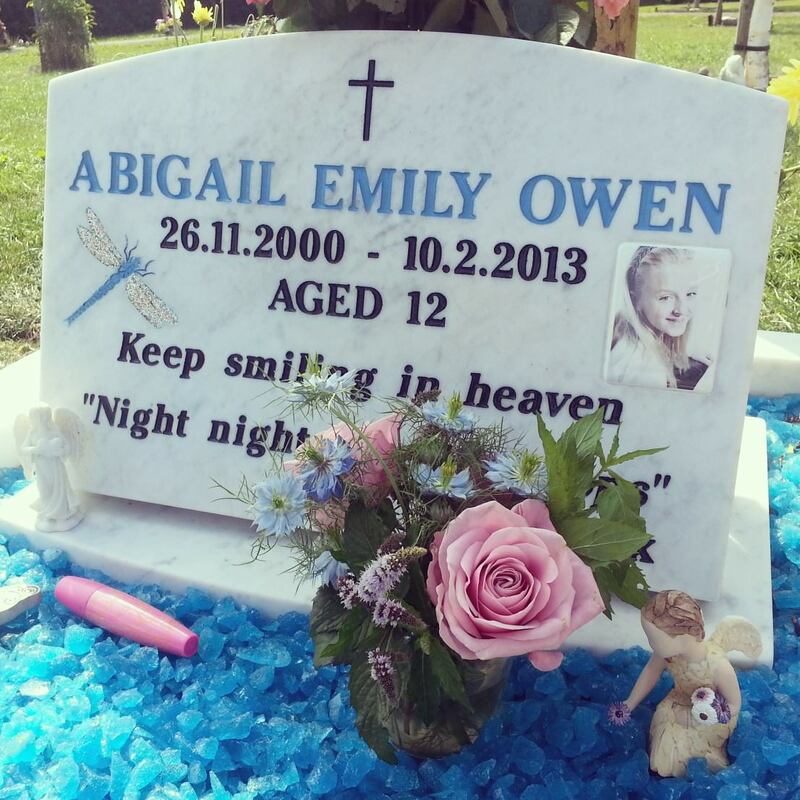 We put ‘night night, cheeky chops’ on Abi’s stone, as that was what Dad said to her every bedtime. At first we wanted some other lines, but it was looking too crammed so we edited it down and kept it as simple as possible within the space. We also wanted a photo of Abi on the stone so that we could see her face every time we visited her, and we had to factor this into our design. 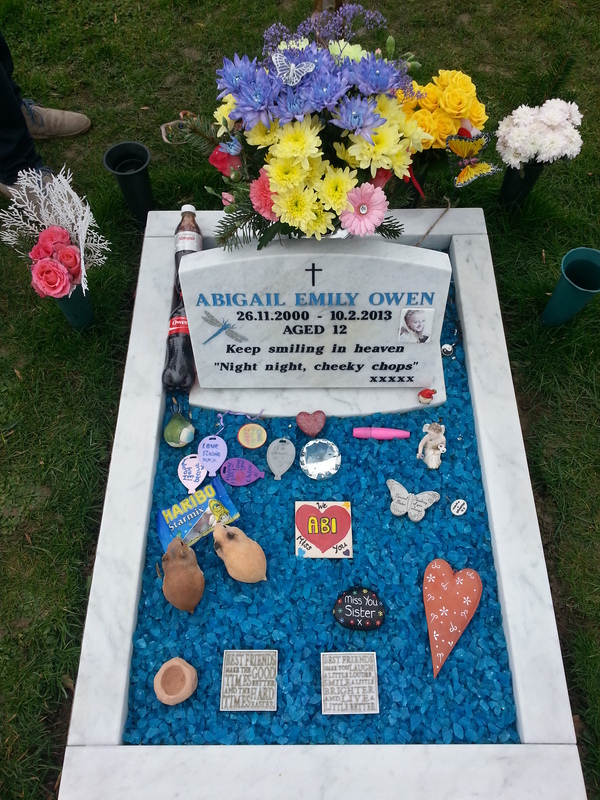 Our cemetery is fairly relaxed and spacious so we were allowed to also have a marble surround for Abi’s memorial. We chose sparkling blue stone to look like a swimming pool (Abi was a brilliant swimmer). It also gave us an area to leave momentos and gifts for Abi (although we do have a box at home to keep the gifts in after a period of time, to save the memorial getting too cluttered). The memorial looks really nicely finished off with a surround so it was definitely worth the extra cost (be warned, it cost almost as much as the stone itself!). Each area is different so do check what is permitted before you go ahead and order something. Your stonemason should advise you too. Stonemasons will have catalogues online or print which you can use to get ideas. It’s also a good idea to walk around a cemetery to get an idea of what other people have chosen. It seems morbid, but once you enter this ‘grief club’ you find you’ll spend a lot of time at the cemetery so admiring other stones doesn’t seem so strange, after all that’s partly what they are for! We took photos of shapes we liked, and lettering or phrases. I don’t think I’ve seen two the same so there is lots of inspiration out there. We chose white marble, to reflect the light that was Abi. Dark stones didn’t feel right. We wanted an upright slab, rather than lying flat, and this is supported by an integral vase. In the cemetery we saw some separate vases lying around and looking rather tired, we wanted ours to stay put and be out of sight to avoid it looking untidy. We paid extra to have the edges of the stone smoothened so they were not sharp. We wanted a soft look to the stone so it was curved at the top and then each edge was rounded off. The engravings on the stone were each carefully considered. We wanted the cross at the top to reflect our faith and the fact she was with Jesus. We wanted her full name coloured in light blue ink, her colour. We chose the full dates of birth and death, and added her age so she is forever 12. We wrote the line ‘Keep smiling in heaven’ as a link to our image of her beautiful smile, now happily at peace. ‘Night, night, cheeky chops’ were the words Dad always said to her (and our other children) at bedtime – she was now asleep for eternity. We asked for a blue dragonfly, which was a new design for the stonemason, but they went out of their way to ensure it was perfect for us. We also wanted space for Abi’s photo, so we could see her when we visited, and had to consider what shape worked best in the space we had. It was a bit of a squeeze but we feel it just about works okay. And the five ‘x’ kisses were for each one of us – we always sign cards with a kiss from each of us, so this was like a sign-off with love – that she is always part of us. We chose a white marble surround to complement and finish off her memorial, and filled it with sparkling blue stones to represent her love for swimming. On a sunny day, as you walk up to the memorial, it’s very inviting as it shines and sparkles. We placed some standard flower holders around the top of the memorial so that visitors can leave their flowers, but we always put our flowers in the main pot. Buying a memorial stone for our child is something we never thought we’d have to do, but the stonemasons we used really helped ease the process for us. Tips and support are thanks to Cleevely Memorials Ltd. This entry was posted in Funerals, Life with grief, Living and grieving by Chasing Dragonflies. Bookmark the permalink. I love how much thought you have put into this and how you have created something so unique and special. Every death is a tragic loss, but when it’s someone’s ‘time’ and they’ve lived a long and full life, it’s very different from a child. It’s great that you were able to create something which reflects her youth and beauty and isn’t boring or drab. The cemetery where Gift is doesn’t allow these. I didn’t think of that when we chose that location. It allows for bronze plaques. It wasn’t made clear that when we bought the plot that the plaque was not included. We found out later, when we felt like we had an idea of what we wanted. It pained us. We thought that there was at least something making where he was placed. Now, ten months later, the stone is being made and should be in place soon. Yes, we are limited to a plaque only. With very specific measurements. I really wanted him buried else where, but my Love was adamant. I figured, all things considered, if this was such a big deal to him then I would go with it. Excellent – thank you. Education is so important.